Here is another driver in my collection. It is as old as my PL11MH-09-08. All these years, it was in storage. I never got down to testing it out, let alone listening to it. So this is going to be another first. Fig 1 is the Frequency Response by Vifa. What attracted me to this midrange is the flat response and the bandwidth. According to Vifa’s specs, it spans from 200Hz to 6kHz. Fig 2 – Vifa M11MG-09-08 RAW Frequency Response. Measurements below 500Hz are in Nearfield. Fig 2 is the M11MG response in my 1.7 liters test box. It looks very similar to Vifa’s plot with the exception that mine rolls off at 7kHz. Mic is at 1 meter, M11MG axis. Impulse Window=5ms. No smoothing applied. 500Hz and below are in Nearfield. Fig 3 is a 1ms view of the M11MG. For clarity, I adjusted the decay for -20dB from the fundamental. It appears that the strongest artifact is at about 14kHz. In Fig 4, stored energy (the light blue slices), is recorded at 1kHz~2kHz. This is not serious. What interests me more is from 5kHz onwards. There are some stored energy at 15kHz that extends to 10 cycles. This will not present any issues because I will be crossing at about 3kHz. At that frquency, whatever stored energy above 5kHz would be rolled off. The Spectrogram in Fig 5 shows virtually no smearing above 5kHz. Lower down, from 2kHz~1kHz, there’s a Green patch at 4ms. This are the light blue slices recorded in Fig 4. I suspect this is due to baffle diffraction from the narrow baffle of my test box. It is not something I worry about. Things show up in measurements but if I can’t hear it, it’s fine. Fig 6 – Harmonic Distortion of Vifa M11MG-09-08. Red plot=2nd harmonic. 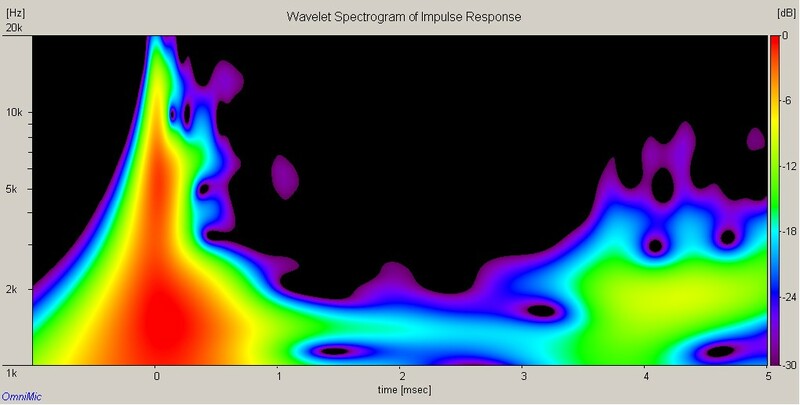 Violet plot=3rd harmonic. Fig 6 is the Harmonic Distortion of the M11MG. Nothing out of the ordinary is recorded. Measurements below 500Hz should be ignored due to romm reflection. As with the PL11MH, I listened to this M11MG without any crossover. And what I found is It sounds wonderful. I can’t tell the difference between the M11MG and the top of the line PL11MH. The midrange warmth and clarity are there in both drivers. It’s too bad that the Premium Line PL11MH and this model M11MG-09-08 are no longer manufactured. These European drivers are in a class of their own.